Nitric oxide (NO) is a free radical with a wide range of biological effects, but practically impossible to visualize in single cells. Here we report the development of novel multicoloured fluorescent quenching-based probes by fusing a bacteria-derived -binding domain close to distinct fluorescent protein variants. 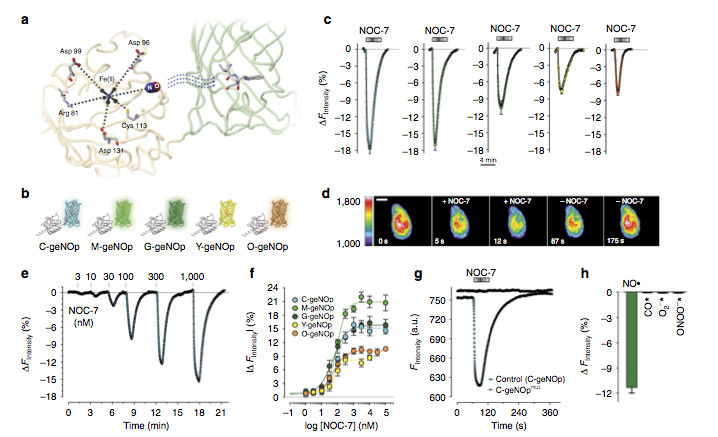 These genetically encoded probes, referred to as geNOps, provide a selective, specific and real-time read-out of cellular dynamics and, hence, open a new era of bioimaging. The combination of geNOps with a Ca(2+) sensor allowed us to visualize and Ca(2+) signals simultaneously in single endothelial cells. Moreover, targeting of the probes was used to detect signals within mitochondria. The geNOps are useful new tools to further investigate and understand the complex patterns of signalling on the single (sub)cellular level.